"Take this delicious, 5-minute prep, jalapeno cheese dip to BBQs, cookouts, parties, or any other occasion. This dish will make you the most popular person there! Serve with bread, crackers, or chips." Combine jalapeno peppers, Parmesan cheese, Cheddar cheese, mayonnaise, and green chilies in a bowl. Cut the top off of the sourdough bread and hollow out the center to create a bowl. 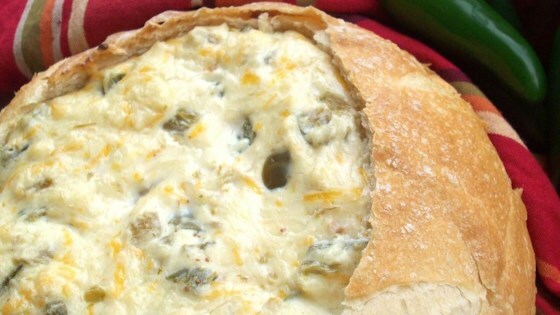 Fill the bread bowl with the jalapeno mixture. Made as written. DH and son ate quite a bit. Nicely spicy with 4 oz. jalepenos. Pretty oily (mayo) so will try with 1/2 mayo, 1/2 sour cream next time.